Moultrie’s flagship model, Moultrie 1100i, is the most advanced mini-camera in the market today. With its high camera resolution and HD video, this mini-camera is probably the best in Moultrie’s line. It has a lot to offer in a small package that will take your scouting to an all new level. This device stands out when comparing game cameras offered at similar prices. 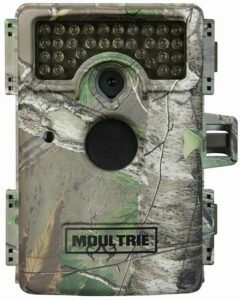 Moultrie 1100i has a 12 MP resolution and a full 1080p HD video. With these high-end features, you will be able take excellent quality and extremely clear photos and videos. You will surely be able to get on a new level of clarity in your scouting. It is also easy for you to set it up in place because of its great internal view screen. This Moultrie camera may have a lot of features to offer, but it is user-friendly and uncomplicated to use. Of course, you need to consult and read the manual especially when you are just starting, but it surely will not take long for you to figure out how this camera works. Aside from all of these, the Moultrie 1100i is also very functional for security and stealth purposes. Because it has a real tree camouflage and no glow infrared flash, you will be able to take photos without scaring any wildlife away. It is also undetectable which makes it a good tool to secure your place. It also has a fast trigger speed, making you capture any movement in the trail. Some night photos may be a bit darker, but this is pretty normal especially for no glow cameras. The photos are still clear enough for you to know the object captured. Overall, this camera surely lives up to the title of being the most advanced mini-camera in the market. It has a lot of options and features, making it a solid camera to choose for your trail activities.